Get ready to catch the big one! Get your pole ready, bait the hook, drop the line and get ready to catch the big one. This game has all the excitement of real bass fishing and you don’t even have to leave the indoors. 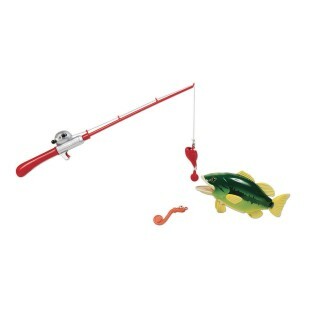 Features a working rod and reel with 2 lures and a battery-powered fish. The fish swims around gently until it gets caught by getting the magnetic lure in its mouth. The fish even fights wildly just like a live one! 9”W x 4”H.